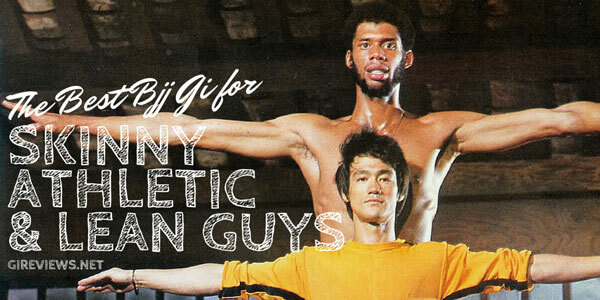 That’s how I felt when I first saw this gi, and even moreso when I received it in the mail directly from Muae. 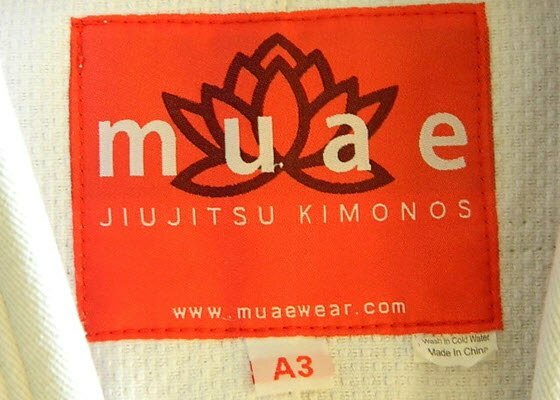 Muaewear really came storming out of the gates, but unlike Kingz Kimonos, who stormed out with 3 very solid basic gis (420 Light, Comp 550, and Ripstop), Muaewear focused all of their efforts on a single, premium, limited-edition kimono that really caters to the gi collector/addict/aficionado. 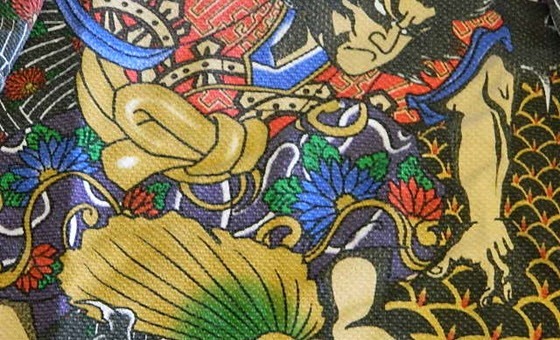 The Muaewear Oniwakamaru fit me exceptionally well. It fit very true to size for an A3 and I didn’t find any of the measurements to be off compared to other ‘average’ A3 gis. I will note however that I don’t have a lot of information about shrinking the gi as I have only washed it on cold and hung it to dry in a climate-controlled environment (i.e. 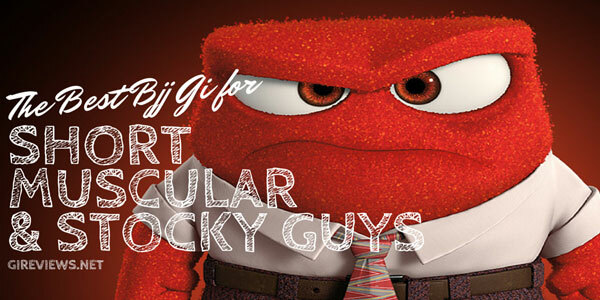 GiReviews HQ Basement). I have read that it does not have a lot of shrinkage to it, but I would suspect that the jacket has been heavily pre-shrunk due to the nature of the printing within it. 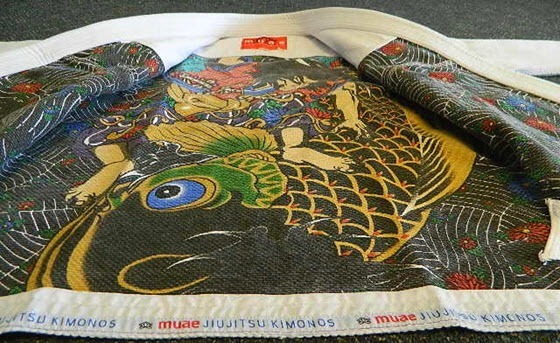 The design is where this bjj gi really stands out. The Muaewear Oniwakamaru gi combines exceptional patchwork, seam tape, and gorgeous embroidery to create a very strong aesthetic. 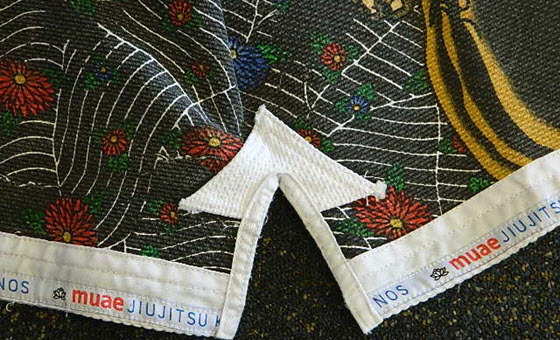 Obviously, the first thing a person would notice about the gi is the printing in the interior of the jacket. Although the printing did fade slightly over time, it gave it the look of an old canvas painting, which I really enjoyed. None of it bled onto any other material or onto my body. But, to be honest, it would’ve been kinda cool to have a temporary body tattoo of the interior! 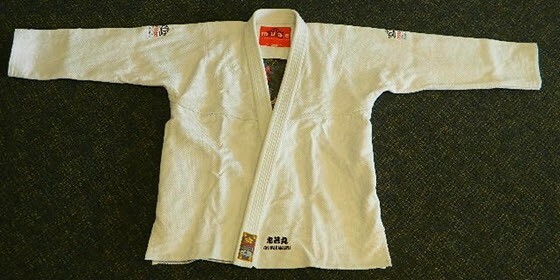 The patches on the outside of the gi are excellent. 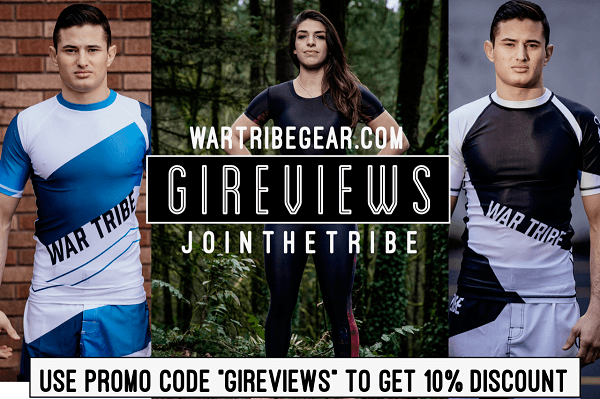 None of them came loose or frayed during my time wearing the gi and I was really blown away by the quality of Muaewear’s patchwork. The patches are very small and understated, but help to deliver a clear design aesthetic that I really appreciate. It was just enough bling on the outside of the gi. In addition to the printing, the interior of the gi features some very clean and non-scratchy seam tape that was really comfortable. 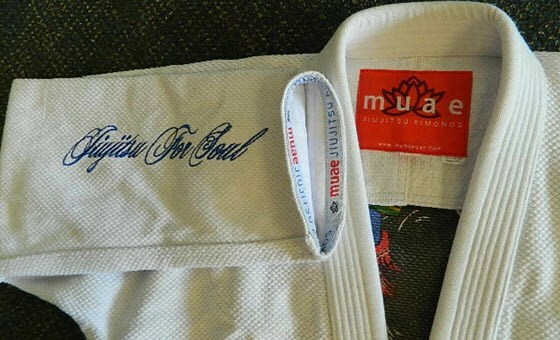 I truly applaud Muaewear for the arm embroidery (seen above) that reads ‘Jiu Jitsu for Soul.’ This very easily could have come across as tacky and uwnarranted, but I thought it flowed perfectly and really reminded me of the cursive writing tattoos that many BJJ players get on their arms (see Andre Galvao above). The jacket is made from 550gsm single weave and feels very similar to the single weave jacket that was on my first BJJ gi (the Atama single weave). It feels very sturdy and the collar is excellent. 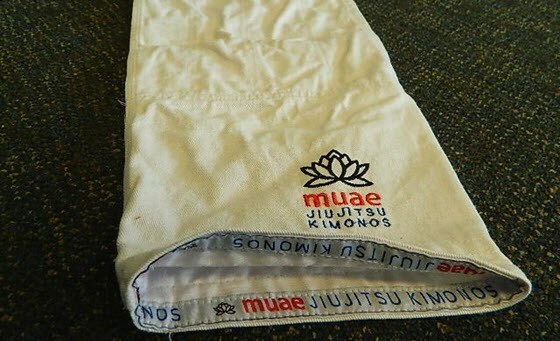 While a bit heavier feeling than some of the pearl weave gis that I’ve worn recently, it’s more likely due to the printing, reinforcements, or the ripstop fabric inside of the sleeves. I have read that the ripstop fabric was meant to prevent stretching in the sleeves, but I found it to be fantastically comfortable to wear and it did not add any extra weight to the jacket. The jacket is properly reinforced in all of the critical areas. This is almost a non-issue any more and I’d be very surprised to find a company that didn’t reinforce their gis properly. 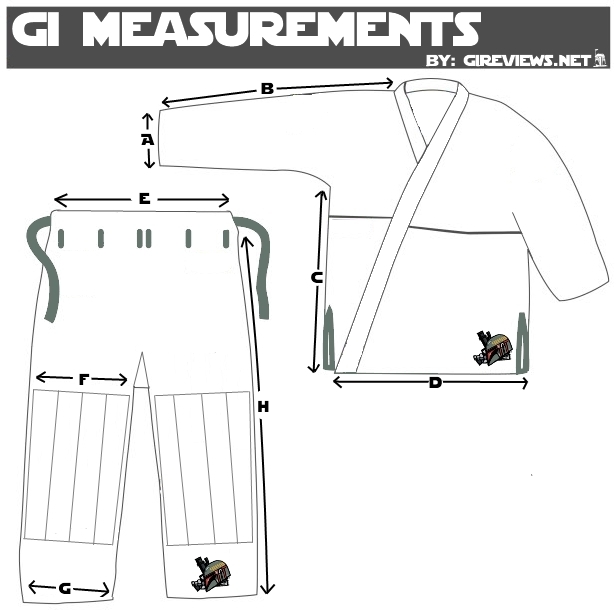 As noted above, the seam tape in the gi is excellent and not only was comfortable, but sturdy as well. The trousers on the Muaewear Oniwakamaru are a very standard 11oz (roughly 320gsm) cotton pant. While definitely not as lightweight as some of my other pants, if you are looking for something with understated and stylish, you will definitely like these pants. They will definitely last just as long as the jacket and I don’t see them ripping any time soon. 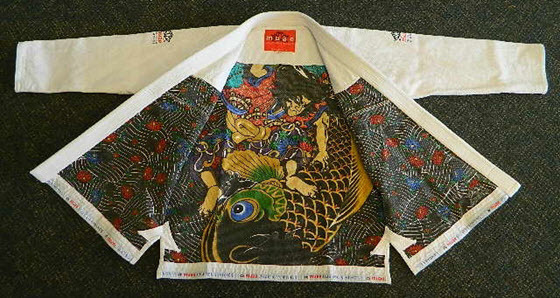 The pants have the exact same seam tape, embroidery, and patches as the jacket which contribute to a great synergy throughout the kimono. Of special note is Muaewear’s choice to go with a traditional drawstring. It was like time traveling back to the days of my first bjj gi and I really enjoyed having a gi with the traditional drawstring system on it. 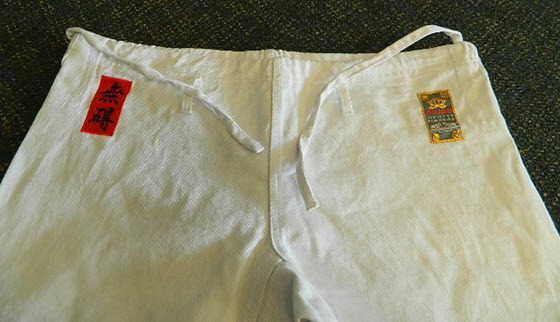 Although I never have any problems with my pants staying tied, it was definitely just as secure of a system as it’s been since the beginning of BJJ/Judo gis. Again, I love the minimalist exterior and this drawstring system really changes the feel of the gi. Great choice by Muae. Much like the Scramble Wave, Muae’s price on the Oniwakamaru (roughly $230 at the time of writing) may deter a lot of people. But, I believe that the gi itself caters to a very different crowd than a lot of other ‘budget gis.’ The art inside is masterfully done and if you know about printing, especially with regard to gi construction, you’ll understand that the printing is not a cheap or easy thing to do. 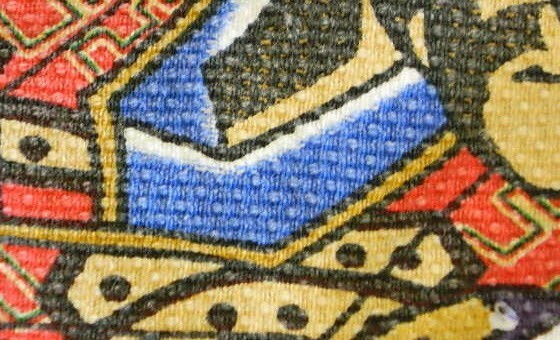 This may be one reason that Muaewear is one of the first companies to undertake such a large interior print. 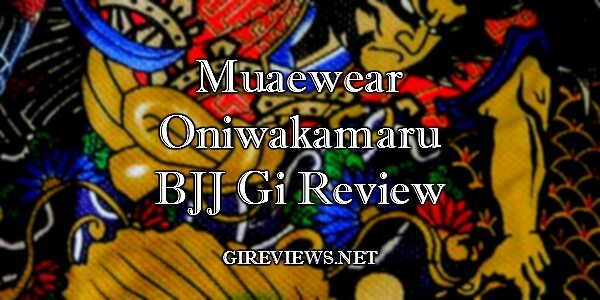 I would highly recommend the Muaewear Oniwakamaru to anybody looking for a premium gis. The exterior has a very smart design and the interior is gorgeous. The jacket and the pants are durable and well-constructed and will last a great deal of time. 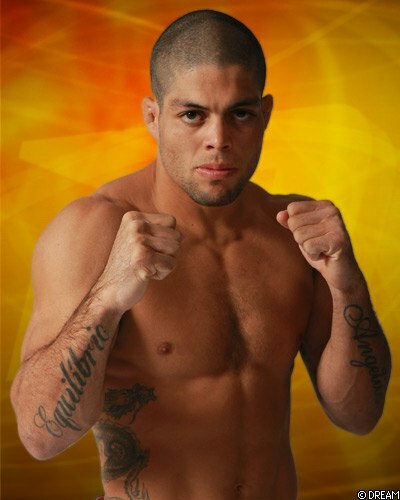 This gi is no longer available. I picked one up during my trip to Korea. The fit is simply perfect for my smaller frame. 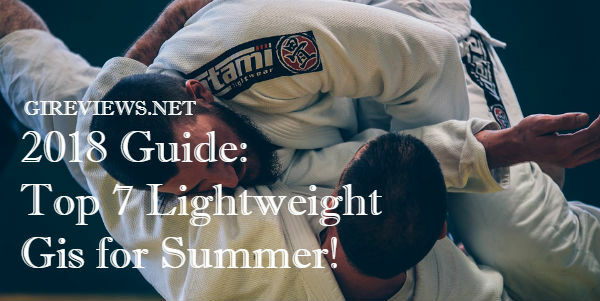 To me, this gi is perfect in all aspects that matter to me – fit, comfort, and sturdiness. I also love how the exterior is very minimal in terms of design comparing to what’s hidden inside. Thanks for the comment Hyunil! I do agree that the ‘old school’ drawstring style definitely does tend to stick a bit more, but I also like that it stays tied way better for me than the new drawstring systems.